I love coordinating weddings but I couldn't do it with out the help of talented wedding professionals. As a way to say thanks I host small party every year for all the vendors to relax & mingle. Some of my past & current clients attend as well. 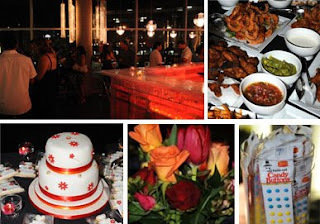 This year the party was held at the Ice Bar, Honolulu Design Center. Yummy pupus & drinks were served. Everyone took home sweet treats...we created a candy buffet featuring classic candies. Vikki from Sunshine Cake Creations made a delicious cake & her famous sugar cookies. Thanks to Paul Herchig for taking pictures! I love your parties every year! I am already looking forward to next year. Thanks for the great parties!